My personal journey of change, transformation and radical leadership. Throughout my childhood I have moved around the globe because of my mother’s work. Born in Botswana, but never living anywhere for more than 4 years at a time (and often landing somewhere in short stints of just 6 months) until my late teens. I am half Ghanaian and half Danish, lived much of my adult life in London and now choose Maputo, Mozambique as my home. You could say I have a fluid identity – what I call “a planetary citizen”. But the idea of a new start, or moving schools, meeting new friends, experiencing a new culture was never confusing, and always exciting to me. I loved the change. And I loved the process of discovery that began when my mother put the option of the next move on the table – and she always did put it on the table. Our relationship has been collaborative and one of joint decision making for as long as I can remember, even when the decision was about her next career move. It is from her that I know that leadership is inclusive and collaborative, a leadership for the collective. That phase of my life taught me about change – and the skills you develop to navigate change. Adaptability. Versatility. Openness. Resilience. Later, as I began my philosophy degree and as I entered the world of work, I was faced with differing perspectives and opinions, many versions of the truth and many ways to scale the same mountain. – Resilience didn’t mean overcoming everything without a scratch, but actually feeling and failing but knowing how to rebuild and practice self care. Although this is not nearly an exhaustive exploration of what leadership means to me, these aspects of my journey and the impact they have had on me goes a long way to defining how I lead. So, as we move towards the launch of the We Will Lead Africa volume I reflect on what is and has been emerging more recently, over the last few years… I notice that my energy and passion is most ignited when I am creating space for radical change and transformation. I am interested in impacting the fundamental nature of things, and I know I am not alone in this. As the stories from our contributors came in from numerous African countries, a variety of contexts and from individuals with completely different life journeys, it became absolutely clear that I am part of a groundswell. And despite the diversity of submissions, I was struck by the common core: the burning desire to be in action, regardless of challenges, for collective impact and for “Future Africa”. In particular, I was touched deeply by the way each contributor envisaged and defined the future they hope and dream about, and work towards everyday. They share a kind of practical idealism, simultaneously boundaryless yet structured and actionable. This to me, is a radical new trajectory for the continent and it’s people. I have also been blessed with two co-editors, Yabome and Judith, who meet me in the most authentic way. Here, I have learnt that leadership is finding your voice, it is listening profoundly to the voices of others, and it is finding the connection and humanity between us, that fuels everything we do. And for me, above all, We Will Lead Africa has been about intentionally carving out a space for voices that get overlooked. It is these voices that must form part of imagining a radical new narrative about what African leadership means. And with these stories we are bringing to life the impact of those that are dedicated to radical change and transformation on the continent. This leadership challenges and inspires; it invites others in; it encourages everyday people to do extraordinary things. I hope that this volume, and the stories within it, can hold a space for you to reflect on what you will change, transform and what you will lead, radically. The We Will Lead Africa volume will be available to purchase on amazon.com from 25th May – Africa Day 2017. Find out more about our launch event here. 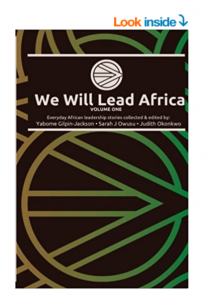 Buy We Will Lead Africa Volume 1 on Amazon today.